Ian McGinty is an American artist, writer, and designer based in Savannah, Georgia. He is the creator of the WELCOME TO SHOWSIDE comic (Z2 Comics) and animated series of the same name (Modern Prometheus). Ian is currently the main series artist for the ADVENTURE TIME comic (Boom! Studios) and artist for the Steve Jackson Games MUNCHKIN card game line. 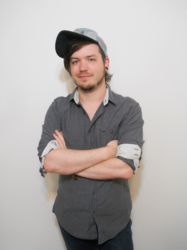 Ian has previously worked on X-MEN: GOLD (Marvel), ROCKET RACCOON (Marvel), BRAVEST WARRIORS (kaBOOM! ); ADVENTURE TIME: CANDY CAPERS (Boom! Studios); STEVEN UNIVERSE(KaBOOM! ); BEE & PUPPYCAT, UGLYDOLL (Viz Media), Bionic Kids (Dynamite), and the Eisner nominated HELLO KITTY books (Viz Media).